We set off early again, although this was not really necessary, as it was wonderfully overcast and cool the whole day. It is a lot easier to ride in the cool. According to Google and the open source map on the phone, today’s route should have taken 60km – however, we ended up riding 91km – due to meandering bicycle paths and a little sight-seeing ride through Kulmbach at the end of the day. We had some wonderful wide smooth cycle paths today and we could ride alongside each other on long stretches. 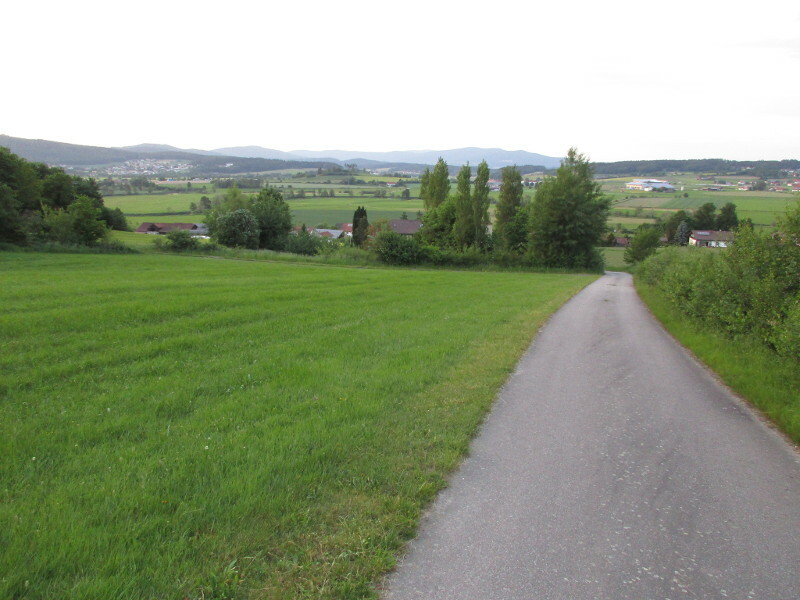 The first part of the ride was fairly flat and through the Main river valley. We were nominally on the Main Radweg – though we lost it a few times due to construction on the roads disrupting it. At one point we rode along a brand new road – no traffic yet and really smooth. 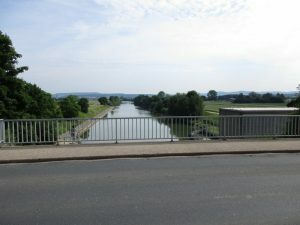 We crossed the river a few times, but otherwise you couldn’t really see the river from the cycle route – it was mostly through farmlands and small settlements. Lots of wheat and corn. We hadn’t realised that today was a public holiday, and had remarked at how quiet it was in the towns first thing in the morning. 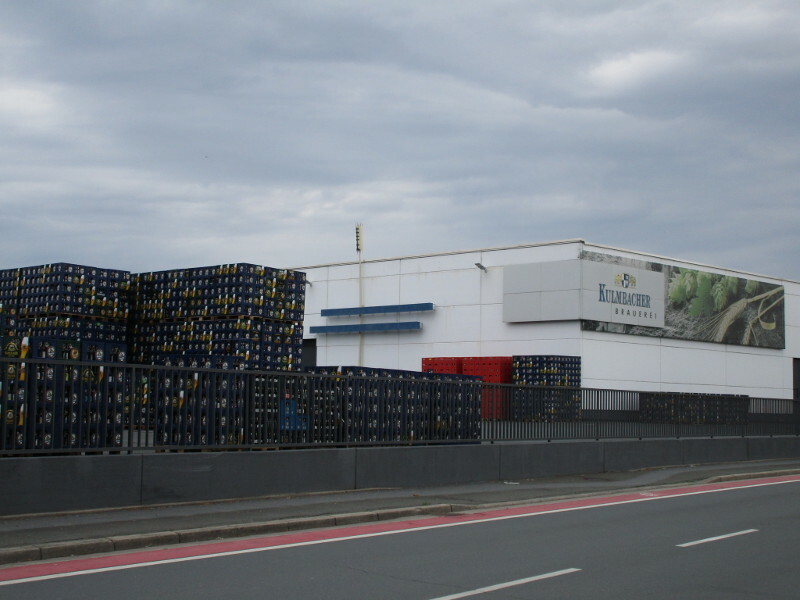 We were planning to buy some bakery goods from a supermarket for breakfast, so it was quite a shock (for Jenny) when the first supermarket we came to was closed. 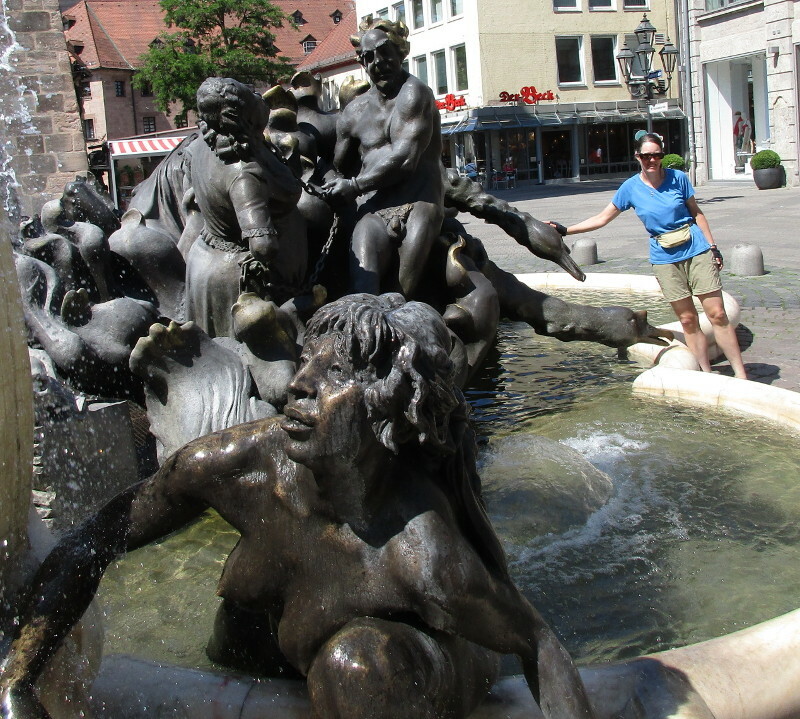 Jenny had to hold out until Lichtenfels at about 10.30am, where we found a small roadside stall with some seating, selling beer and bratwurst. There were already several men standing around drinking beers and smoking. A bratwurst with bread roll and mustard went down very well. An hour or so later we found a bakery and cafe at an intersection. 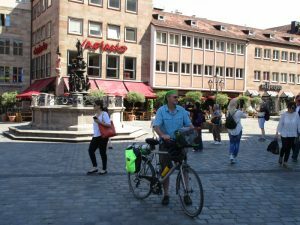 It was quite busy – it must have been one of the few places open – there were other cyclists and motor cycle tourists also stopped there – everyone was drinking coffee and eating pastries. 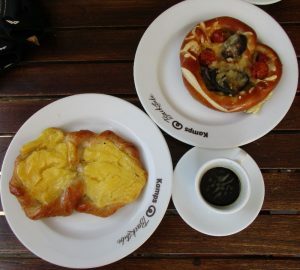 We also enjoyed some coffee, cheesecake and nut pastry before setting off again well satisfied and with a takeaway pastry too. 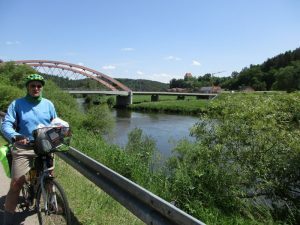 We had a few more rolling hills before we came into Kulmbach, and the last part of the ride was all alongside the railway line. 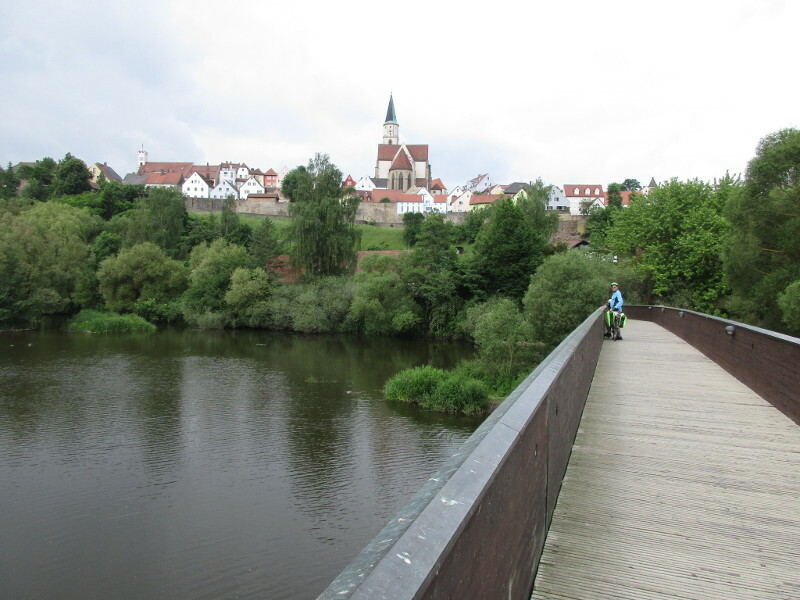 It began to threaten to rain, with a few drops falling as we arrived into Kulmbach. 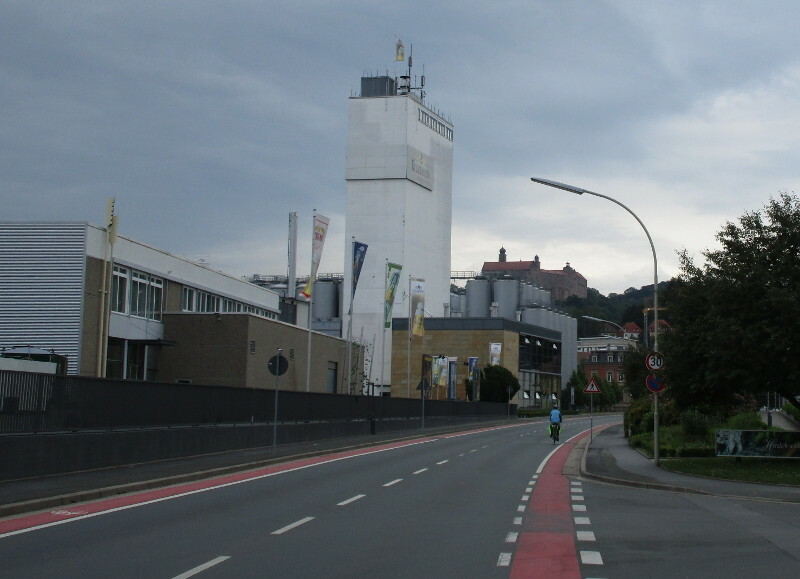 One of the first things you see on entering the town is the brewery (Kulmbacher), which is huge. The other thing you notice is the castle up on the hill. 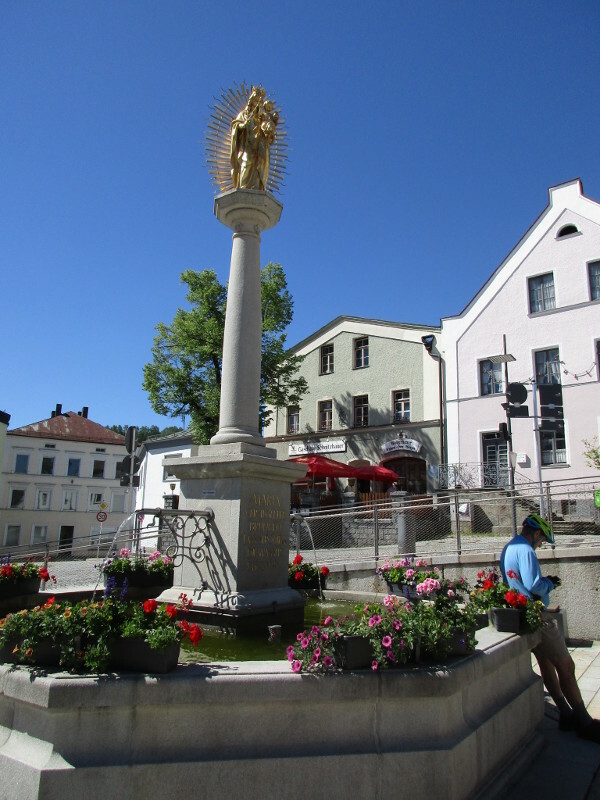 The old town is beautiful – nice and small with lovely old buildings – with lots of people sitting drinking beer and eating ice creams at outdoor cafes. It began to rain properly just as we were leaving town for our accommodation about 2km away. We were quite damp by the time we found it. It is a small guest house (Landhotel Schwartzhof), next to some stables that breed thoroughbred horses and a beer garden. 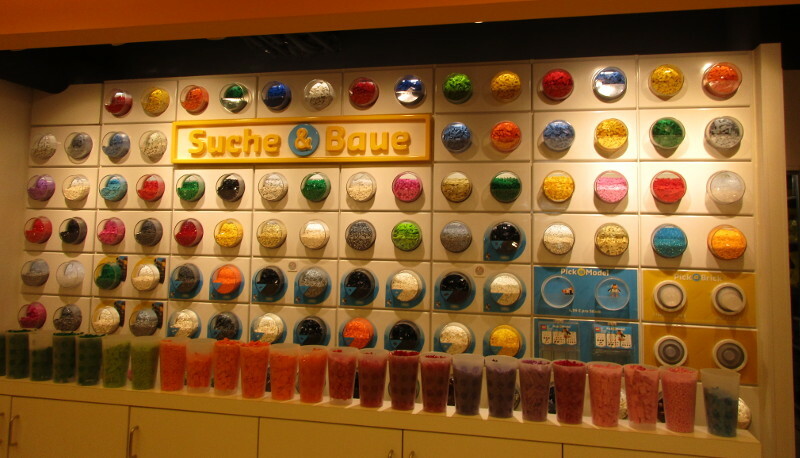 However it was all closed up when we arrived. 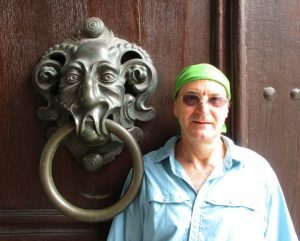 Kris sent a text to the phone number posted on the door and soon a man stuck his head out an upstairs window and called to us. We were expected and he welcomed us in. The room is very beautiful – larger and more characterful than the last few more expensive rooms we staying in at more commercial hotels. 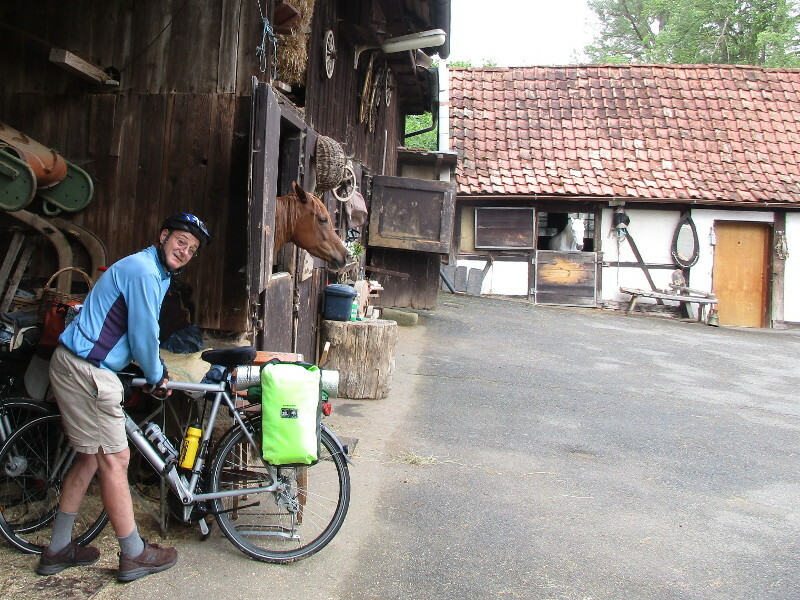 Here is a photo (from the next morning) showing how our bicycles slept overnight – in a stable alongside the horses. We had a simple but good meal that evening and a lot of political discussion with the hotel owner and other guests. 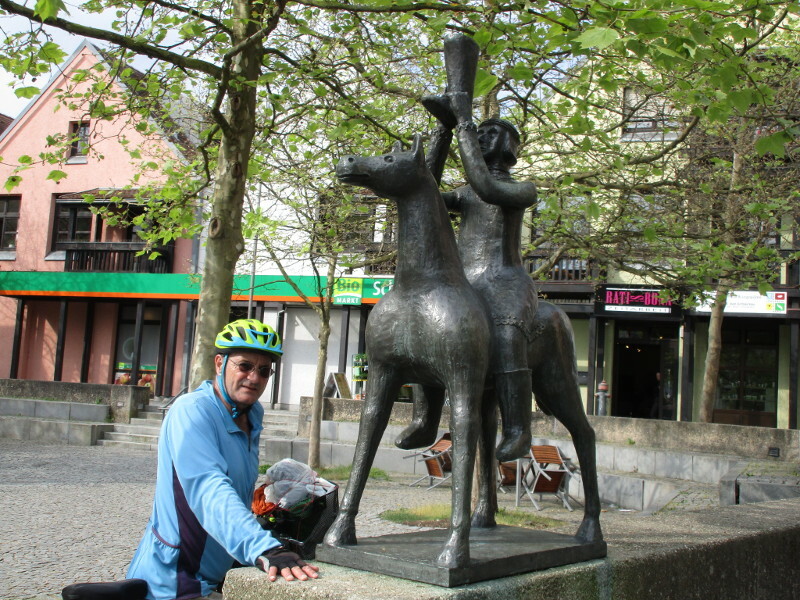 One was a retired cycle tourist, one a retired local (regular) and another a politician from Berlin! We tried the smoked beer that they make in Bamburg – it is quite strange but not unpleasant. The smoked taste comes from smoking the barley before brewing. It was good timing for a non-riding day, as it rained the whole morning. 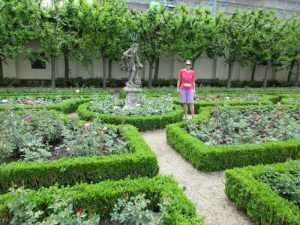 We relaxed in the hotel until around 11am, when we ventured out to do some sight seeing. 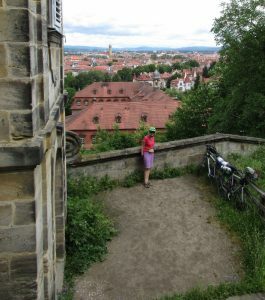 Bamburg is a beautiful city set alongside the Regnitz river and evidently over seven hills (I’m not sure we climbed them all!) – there is a lot to see here. Look how happy he looks next to her! 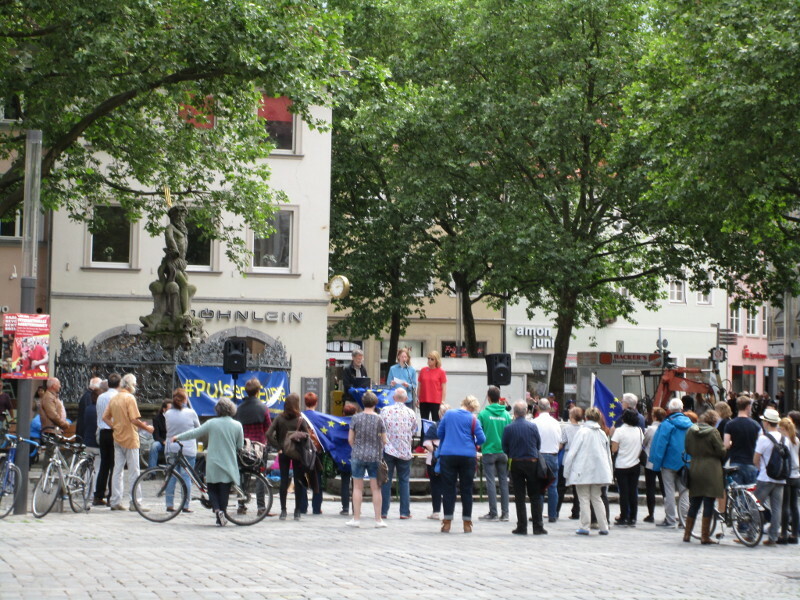 We were interested in the “Pulse of Europe” demonstration in one of the pedestrian shopping streets. They are a citizens initiative against Trump and Brexit and advocating for European unity. 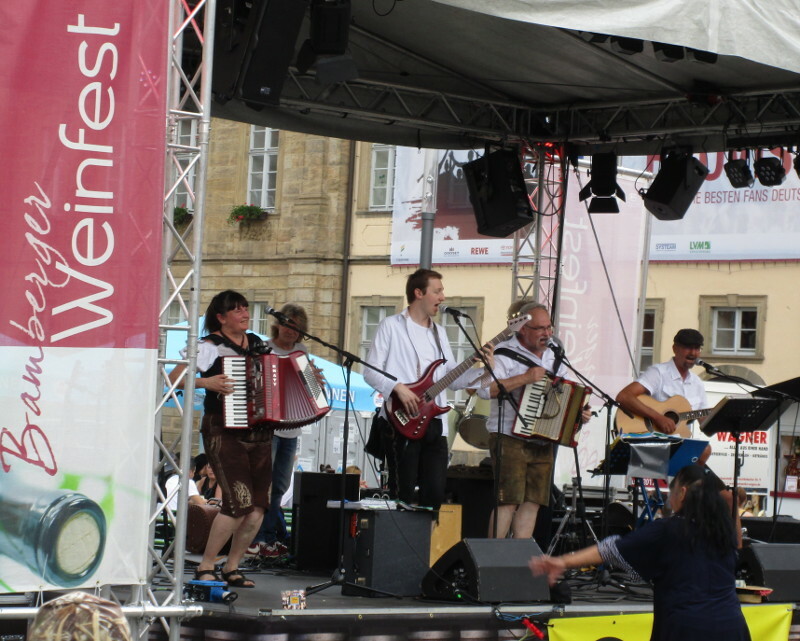 We ended up at the wine festival again – eating some Bratwurst and drinking beer – and enjoying the live music. The excellent German cycling infrastructure is encouraging more and more people to become cyclists. 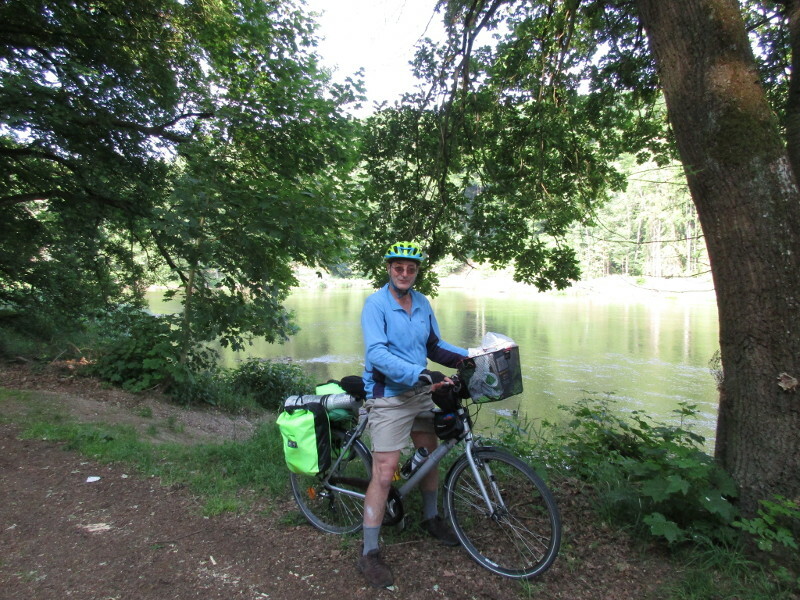 Many older Germans are taking up cycle touring in their retirement. 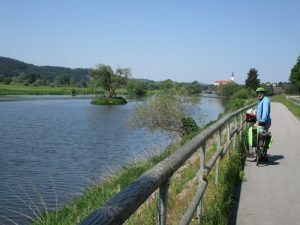 The combination of new and established cyclists can be seen in the choice of bicycles. We often see older cyclists, well past their retirement, at supermarkets with bicycles that may be as old as their children. Some of these older cyclists seem to have trouble walking but have no trouble making a smooth exit on their bicycles. Some newbie tour cyclists buy expensive bicycles. 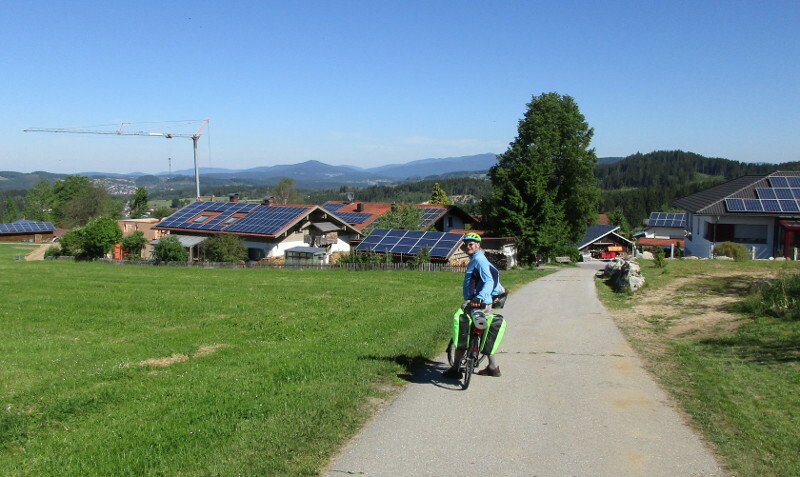 For example, an elderly pair was touring on mountain bicycles with double suspension systems that are battery powered and have custom made batteries. Their bicycles required specially made attachments to mount luggage. German electric cycles are well designed for short term usage, but not for long term maintenance. Most German electric bicycles have the motor and battery integrated with the pedal system. The propulsion is all on the chain, so this causes more wear on the drive chain and rear cassette. In my opinion the best electric bicycle design have the electric motor on the front wheel. This separates the maintenance of the mechanical drive system to the rear wheel and the maintenance of the electric drive to the front wheel (making the bicycle simpler to maintain and also causing less wear). It also provides a bicycle with drive traction on both wheels. We are traveling on very cheap Decathlon Hoprider 300 cycles that are cheap to maintain. Sometimes people ask us – Are those good bicycles? The correct answer is “Yes, top of the range”. They are top of the range at Decathlon. And all this diversity can only be good for the evolution of the next generation of bicycles. This morning we had a nice early 7.30am start while it was still nice and cool (though a thermometer outside a pharmacy advised it was already 22 degrees!). 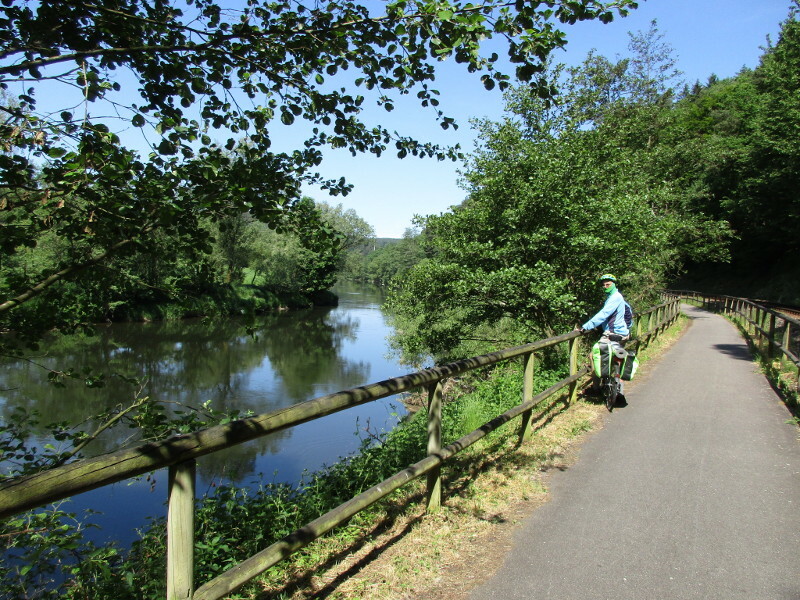 We found the river path quickly and rode amongst hundreds of Saturday morning dog walkers, joggers and cyclists. Cycleway signs informed us that there is a cycle route called the Regnitz Radweg that goes from Nurnberg to Bamberg and we stayed on this for the rest of the ride. We spotted a cute squirrel along the way. We have seen quite a bit of wildlife on the bike paths so far – foxes, huge hares, smaller rabbits and deer. 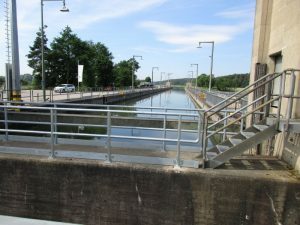 Most of the route was alongside a huge modern canal – the Main-Donau-Kanal (1960-1992) – still very much in use with barges transporting coal and other loads to Nurnberg. We arrived in Bamberg at about midday, after riding for 73km, and just as the heat was really starting to build up. We had booked for two nights at our most expensive hotel yet, though it is pretty basic and about 5km from the center – we couldn’t get anything reasonably priced in town. When we went out again at about 4pm it was still cooking. 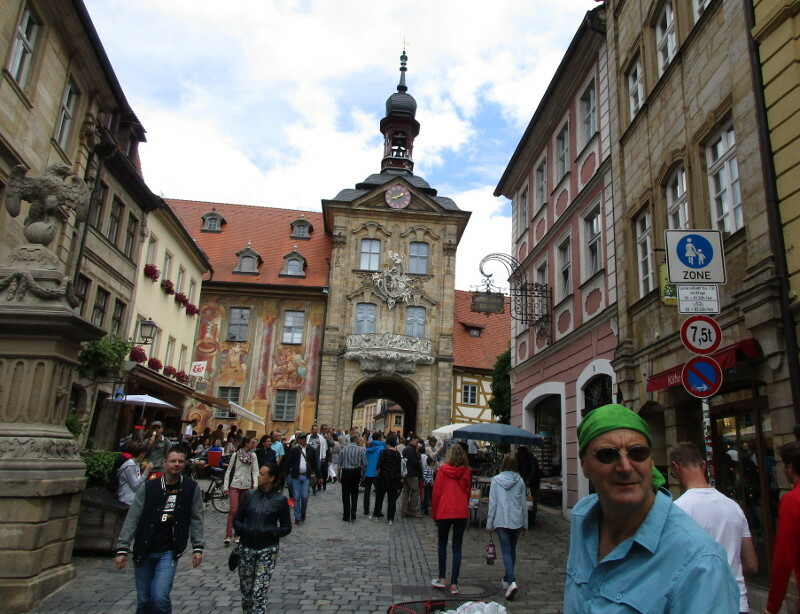 We found a supermarket to buy some food and then headed into the town center. 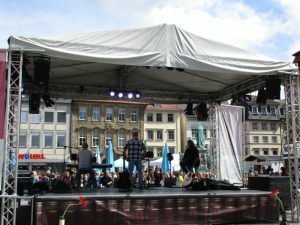 We stopped our exploration when we came across a wine festival happening in a town square. 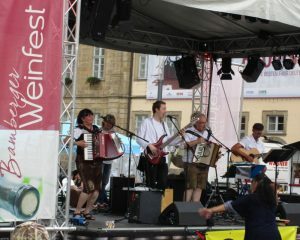 There was a band wearing Lederhosen and playing Schlagermusik on a stage. There were stalls selling food and wine and beer, and many long tables at which to sit. 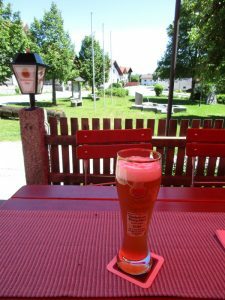 We enjoyed drinking some Weizenbier here – the beer we now seek out in Germany – it is very refreshing after a long hot bicycle ride. Just as the first band was finishing up, it clouded over, there was some thunder and it started to rain. 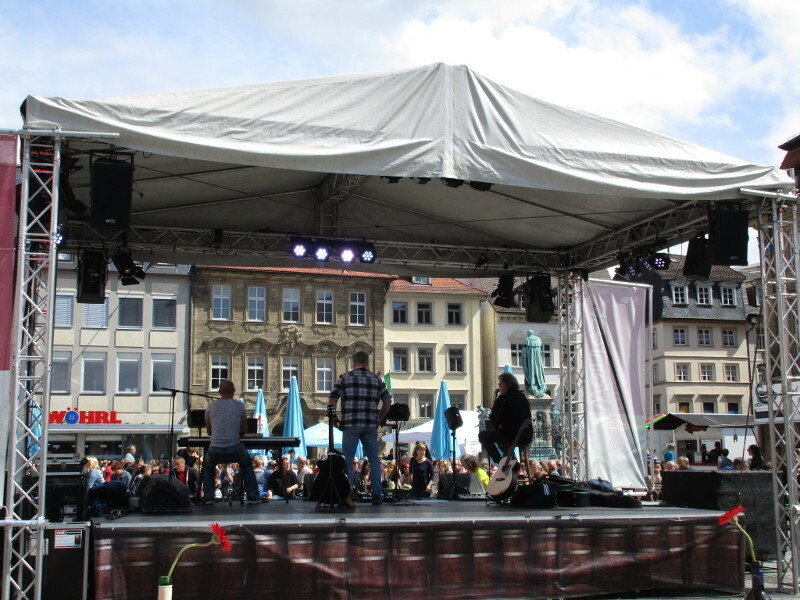 Everyone moved under the sun shades. We waited around for the second band to start and the rain to clear. After about another hour we couldn’t wait any more (or drink more beer), so we took off, it was not too wet getting home. 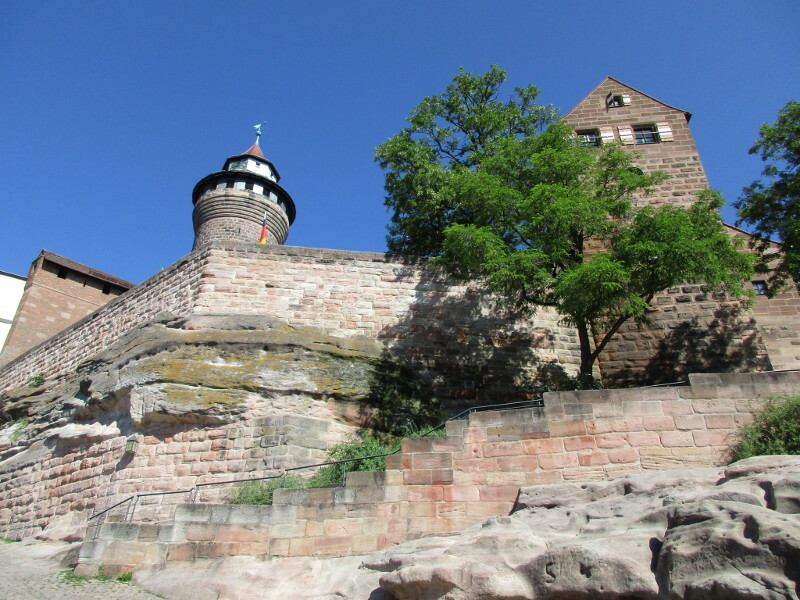 Today was a relaxed day sightseeing around Nürnberg (22km). 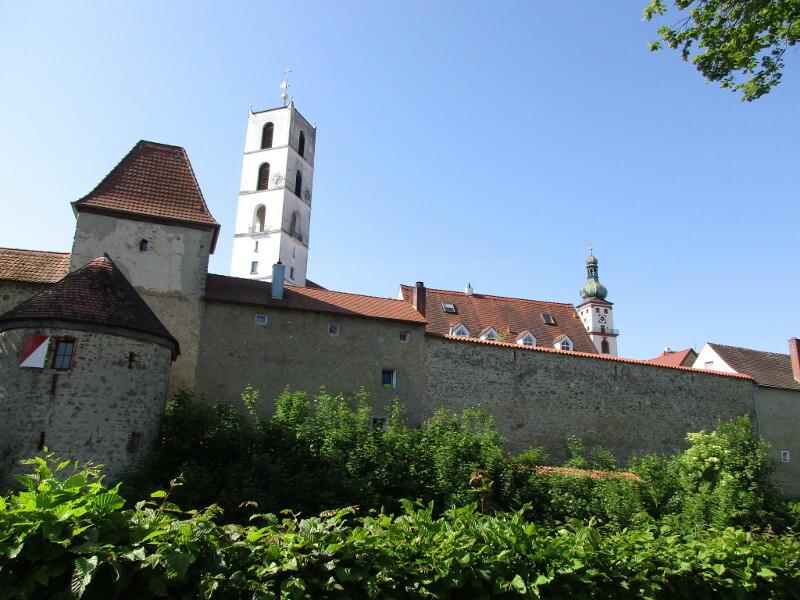 There is a lot to see, including several impressive churches and an old castle. 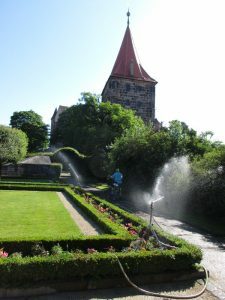 Castle garden – cooling off under the sprinklers! Nürnberg is the second largest city in Bavaria (after Munich). 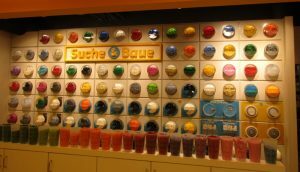 We enjoyed the wide pedesreallytrian only shopping streets. We are loving the German baking – couldn’t resist this “pudding bretzel” and cheese bretzel with coffee at a cafe/bakery – sitting outside and watching the people go by. A shop that interested us was the Lego store. This was a pretty outrageous (entertaining) modern fountain. 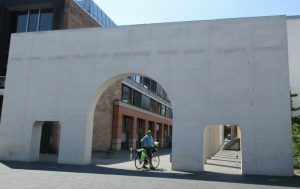 The human rights monument references the UN Declaration of Human Rights. Each pillar has one article of the declaration inscribed on it in German, and in another language below the German – a different language on each pillar. 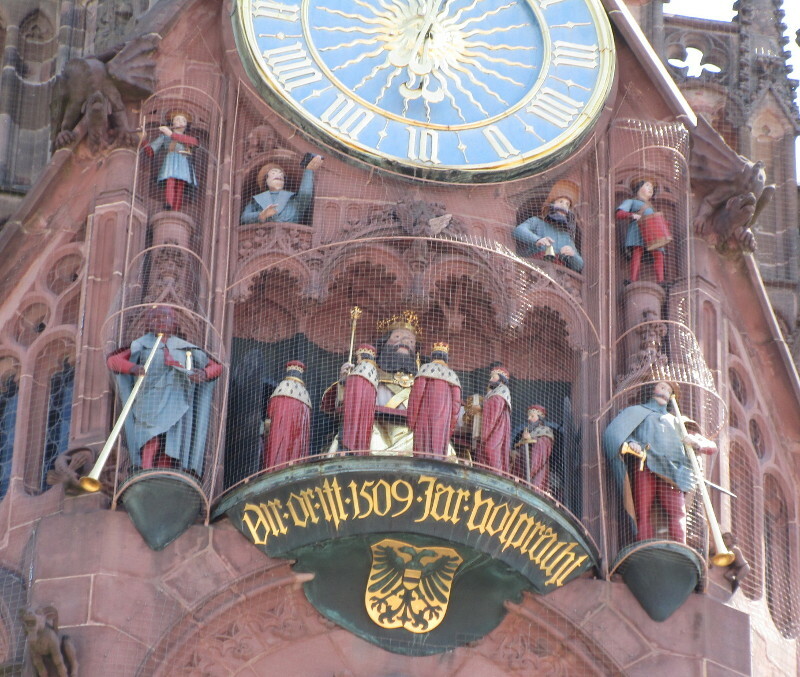 We were back at the 14th century Frauenkirche at midday, when the mechanical clock (Männleinlaufen) activated, as it does every day. The trumpeters and drummers trumpet and drum while the “prince-electors” process around the Holy Roman Emperor. 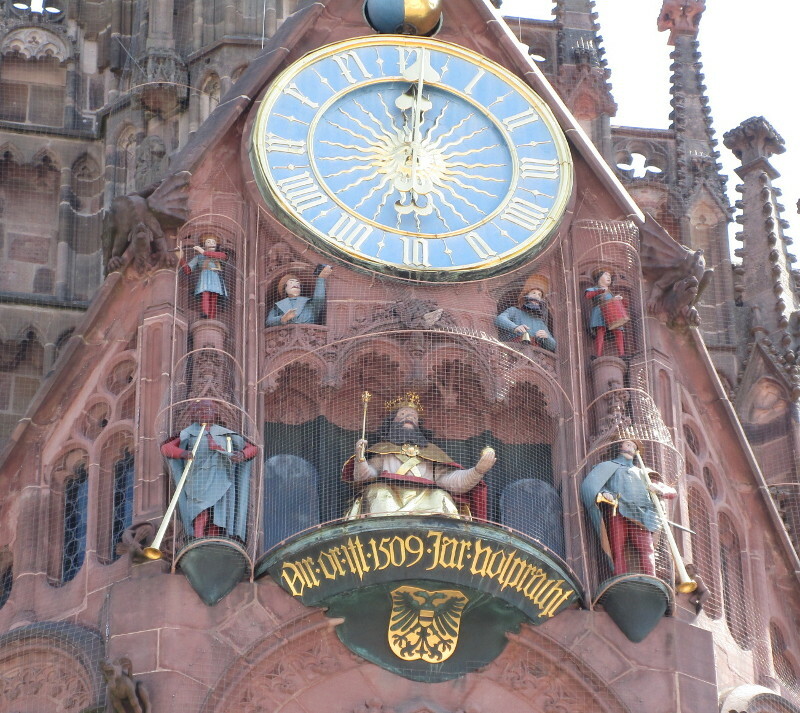 Kris standing in the shade (under the clock) while all the tourists photograph the mechanical clock in action. At the end of our city tour we found a pub where local people were eating and drinking – a little away from the center. 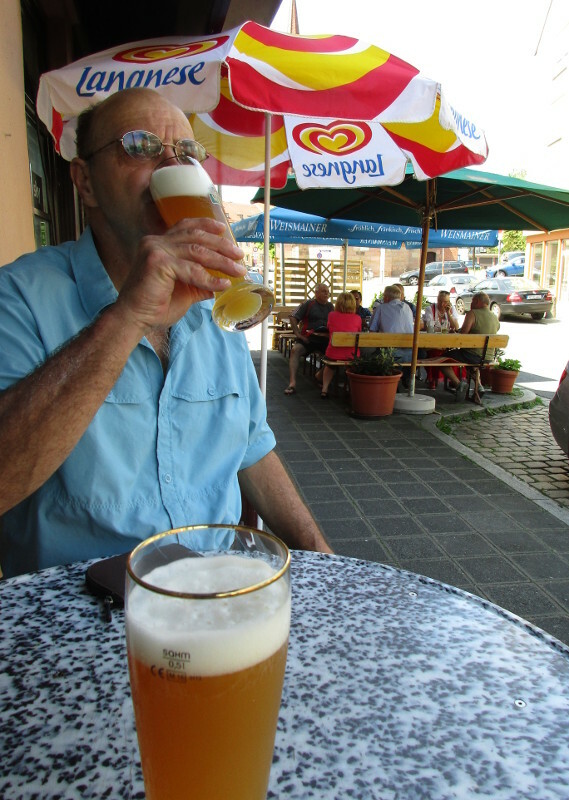 We cooled down with some Weizenbier and also enjoyed some asparagus soup. Today was a long hot ride from Hirschau to Nürnberg. 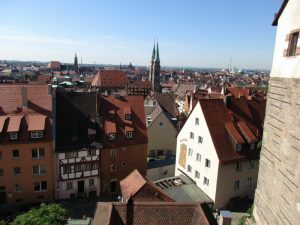 We had completed 87km when we reached our Nürnberg hotel. 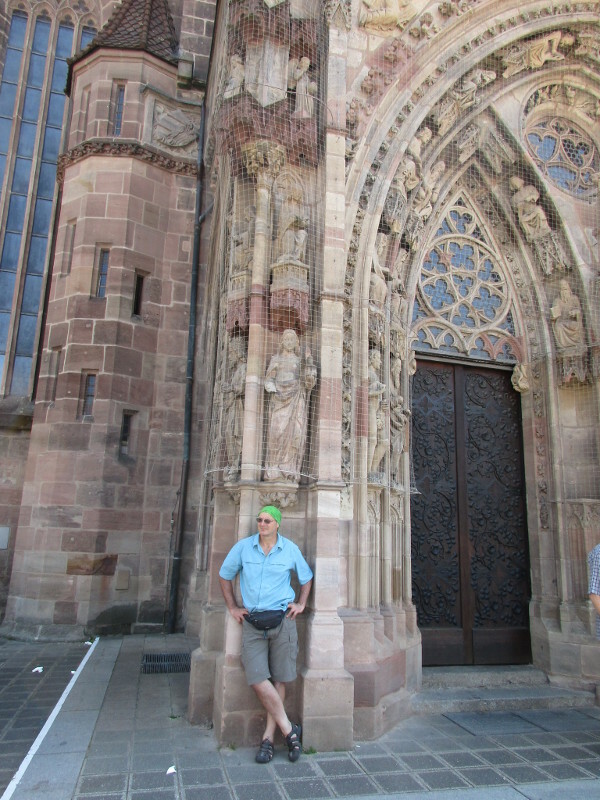 And 100 km after riding around Nürnberg in the evening. 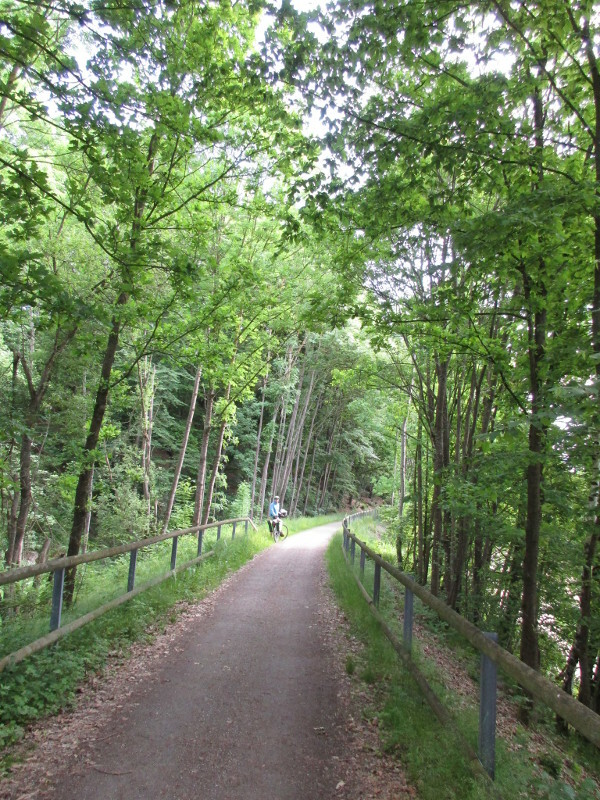 The first part of the bicycle path was not very easy to follow. 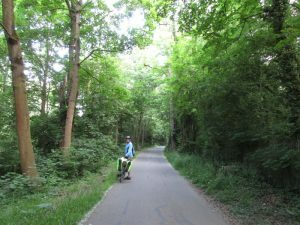 At one point it seemed to want to take us up and around onto obscure forest paths – we took a more direct and easier (still rural) road. We passed through Sulzbach-Rosenberg – a bit of a climb up into the town and then back out again, after getting directions from two cyclists. 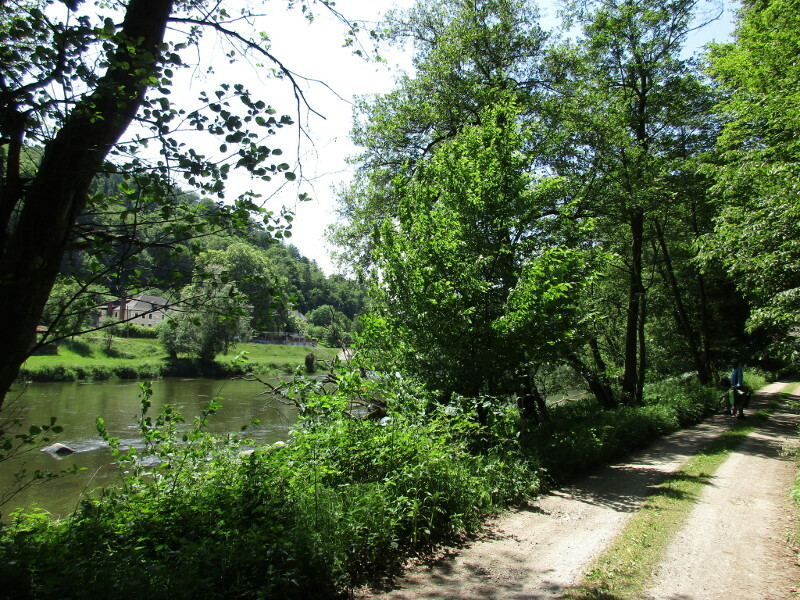 The bike paths sorted themselves out for a while, as this is the where we joined the Fünf Flüsse (Five Rivers) Radweg. However we lost the signs again soon after town and Kris had to rely on his navigational skills to keep us on track. 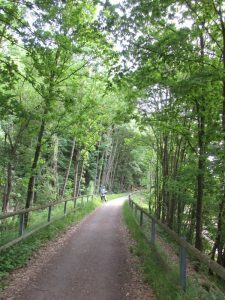 The path became really nice after Etzelwang, when we ended up riding in a pretty valley alongside a little river, away from the main roads. There were horses and lots of wheat fields. There were a number of touring cyclists, obviously a more popular part of the cycleway. 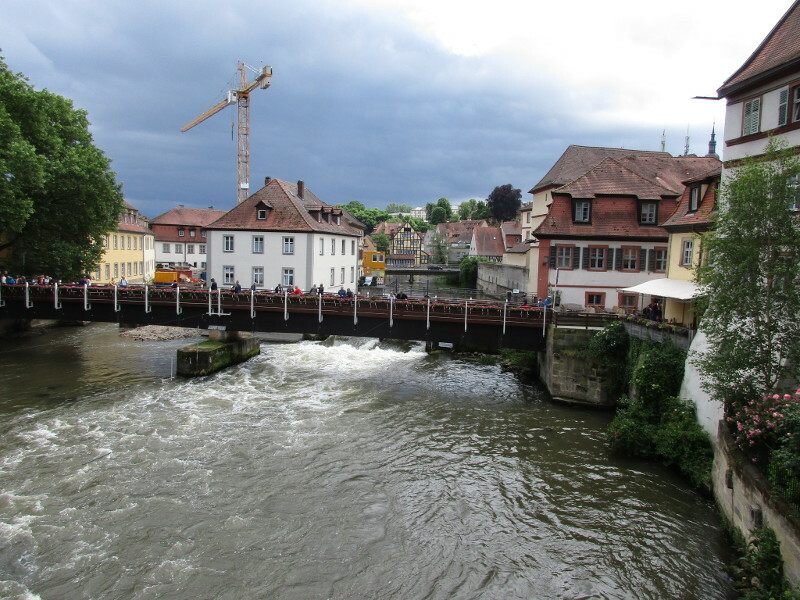 We considered staying in Lauf and looked around for accommodation for a bit. It was extremely hot and we could not find an open tourist office, only a list of places outside an information center. 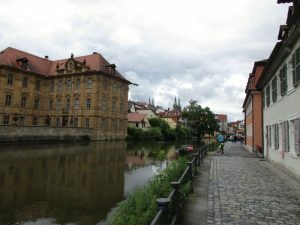 The town was picturesque alongside the Pegnitz river. 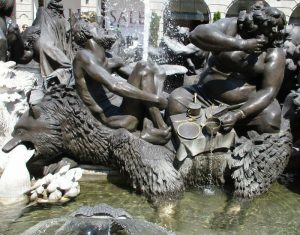 It was full of tourists eating and drinking at expensive looking restaurants. 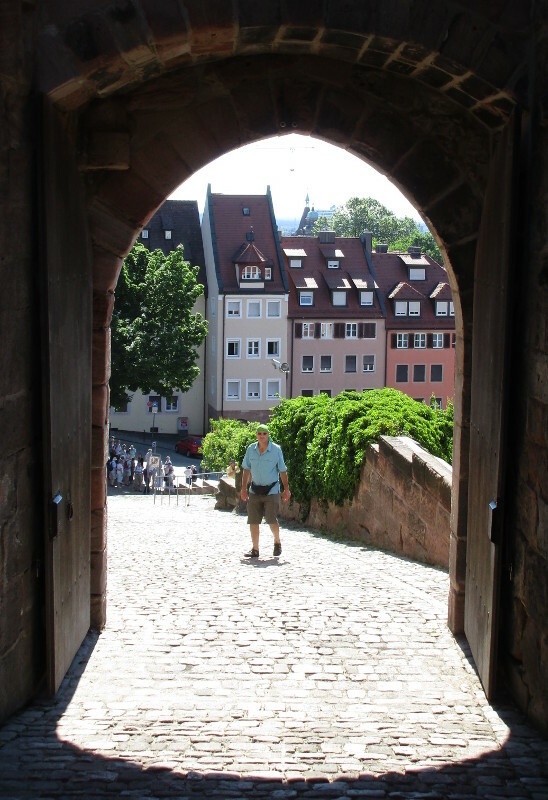 Kris decided we should push on to make Nürnberg. We were very hot and sweaty when we presented ourselves at the Nürnberg Tourist Office. They were helpful and we organised a hotel for two nights, to give us a chance to see the city. 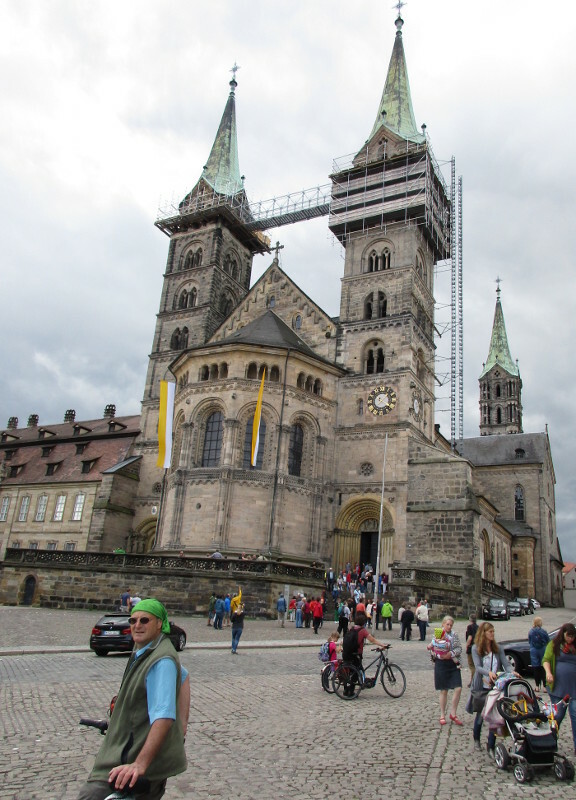 The Tourist Office is just outside the Frauenkirche and market square. 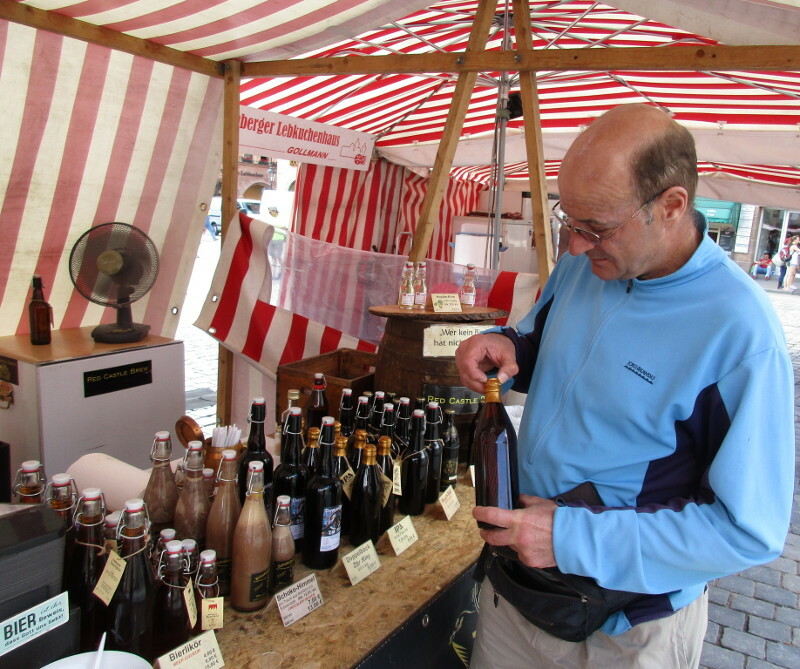 Kris spotted an IPA at a market stall for a local brewery. 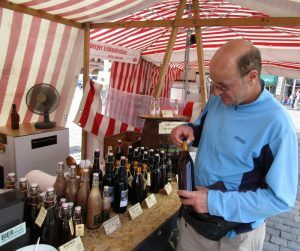 We were offered a taste and it was really good, so we couldn’t resist buying a cold bottle to drink right away – in this part of Germany you may drink on the street, as long as you are standing or walking. 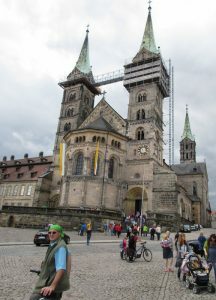 Jenny bought a Lebkuchen (German gingerbread) from the stall alongside. It was delicious with the beer – and we were told that we were following a 700 year old tradition – to drink beer and Lebkuchen when arriving in Nürnberg! The combination of the heat and beer lead to a nice sleep once we had found our hotel room and had a shower. We set off again in the evening to search for food and drink. 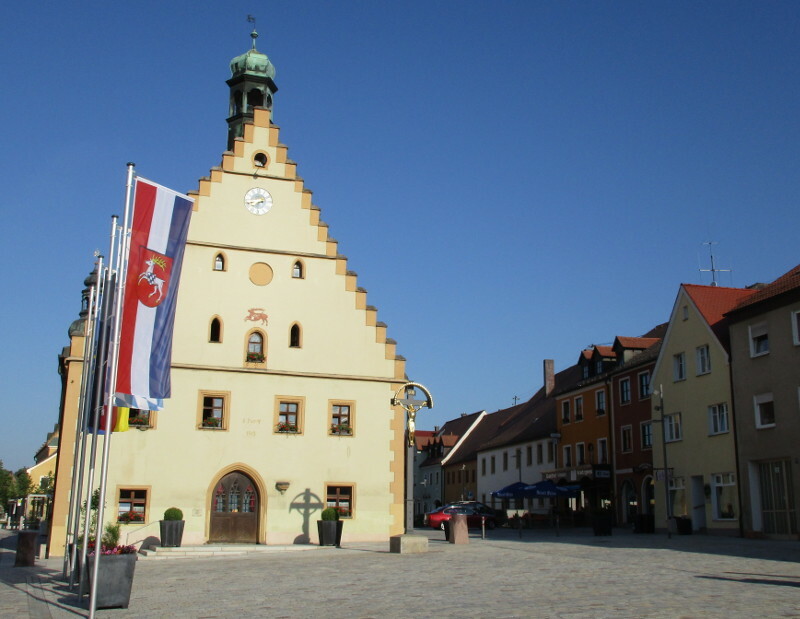 We found a supermarket and stocked up on a heap of goodies – we love the packed salads you can buy in German supermarkets at a very reasonable price. 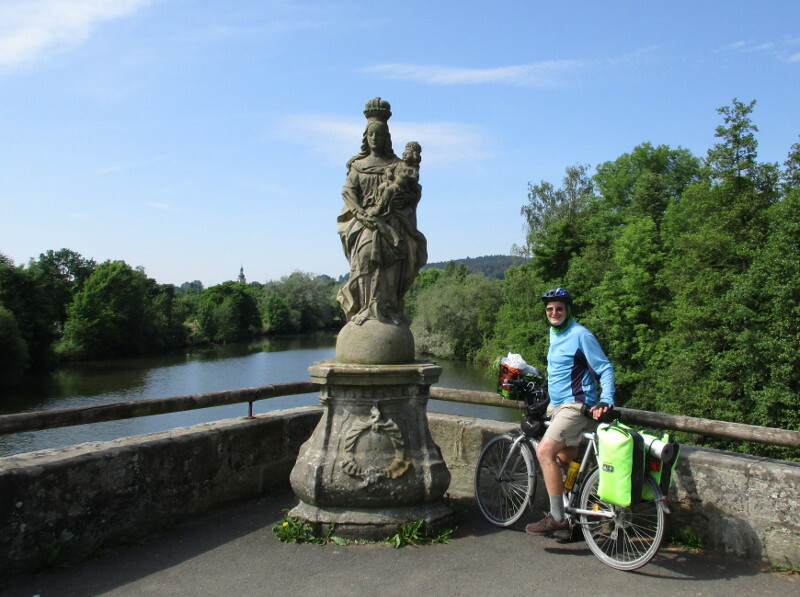 We rode around the gardens alongside the river – it was lovely there with lots of people out cycling and walking. We stopped first to eat our ice creams. 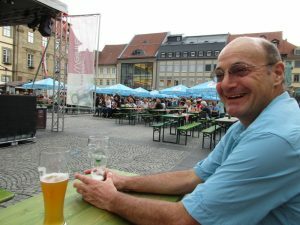 Then we found a beer garden next to next to a swimming pool and tennis courts, where we had a beer before going back to our hotel room for a late supper. 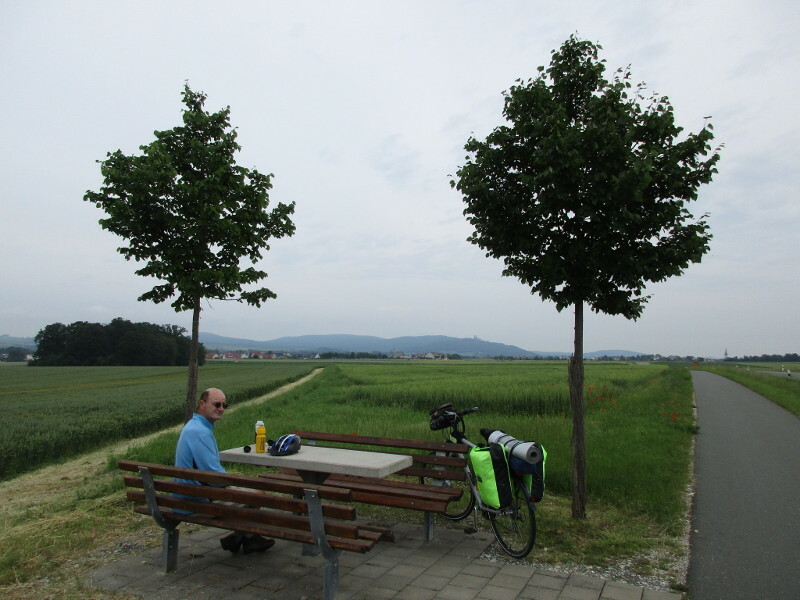 Today we traveled along the Naabtal Radweg – 72km from Burglegenfeld to Hirschau. We started riding out of Burglegenfeld along the Naab river. 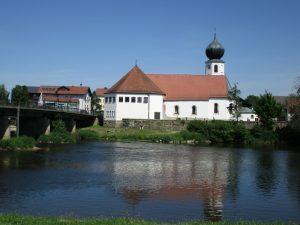 We paused at Schwarzenfeld to have a quick look at the town – including an old watermill. We don’t know why the statue is holding a boot aloft. From here on we rode alongside the train tracks for a long while, through productive rural farming country. We paused again at Nabburg, to admire the walled town and church, all perched up on top of a hill above the river. 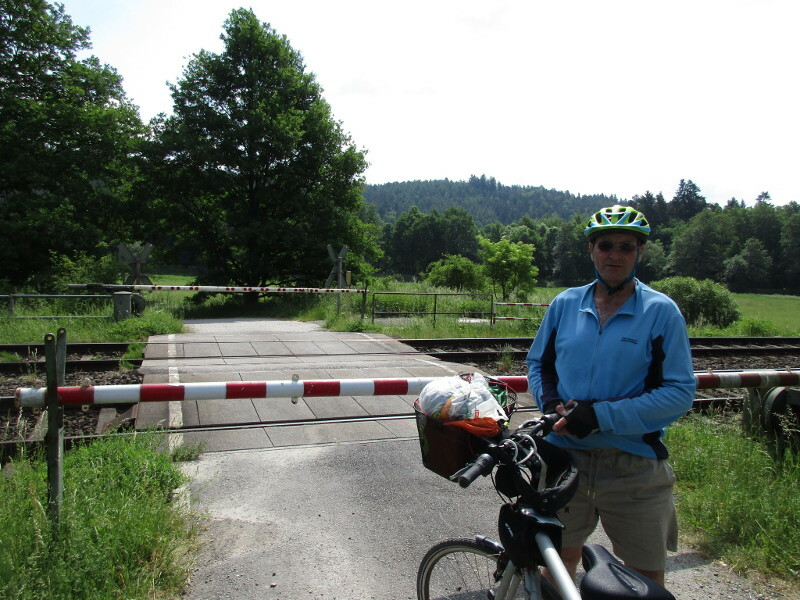 At one point we had to stop at this railway crossing – the gates were closed and there was an intercom with a button you had to press. Jenny pressed it and in a little while a voice asked us to please wait as a train was coming – just as well Jenny understands German! Once the train was passed, she asked Jenny to confirm that it had passed by, and then opened the gates for us. 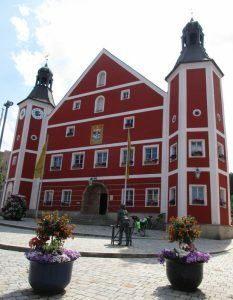 We stopped at the town hall in Wenberg-Koblitz to ask for information on accommodation in the next ten kilometers or so. 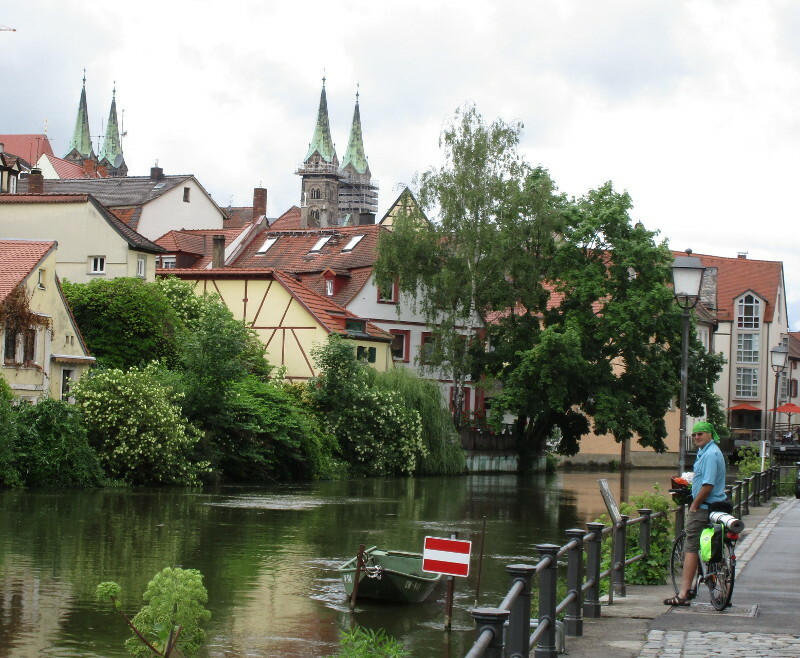 We decided to segue to the West, towards Nurnberg, staying at Hirschau that evening. 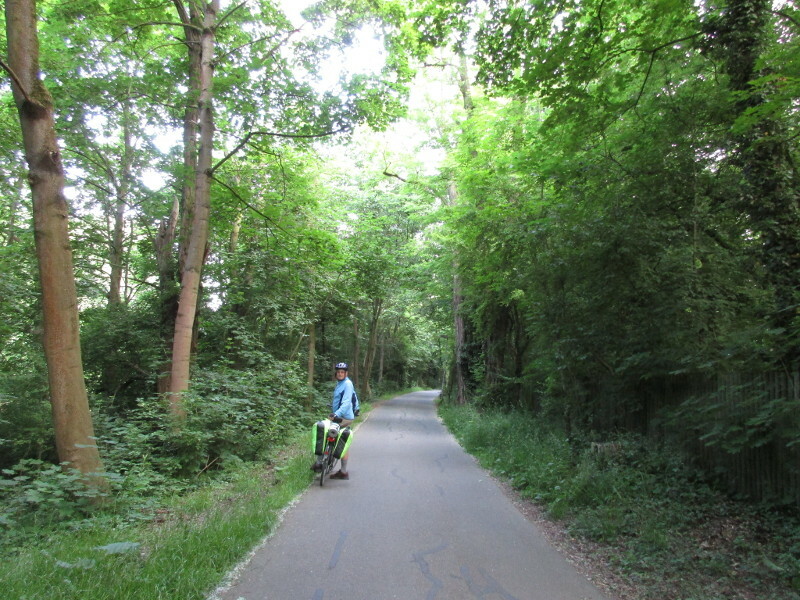 The first part of this road was an excellent cycleway alongside the main road through a forest. The road became a bit chaotic just before Hirschau, with many trucks, as we approached a large Kaolin mine. 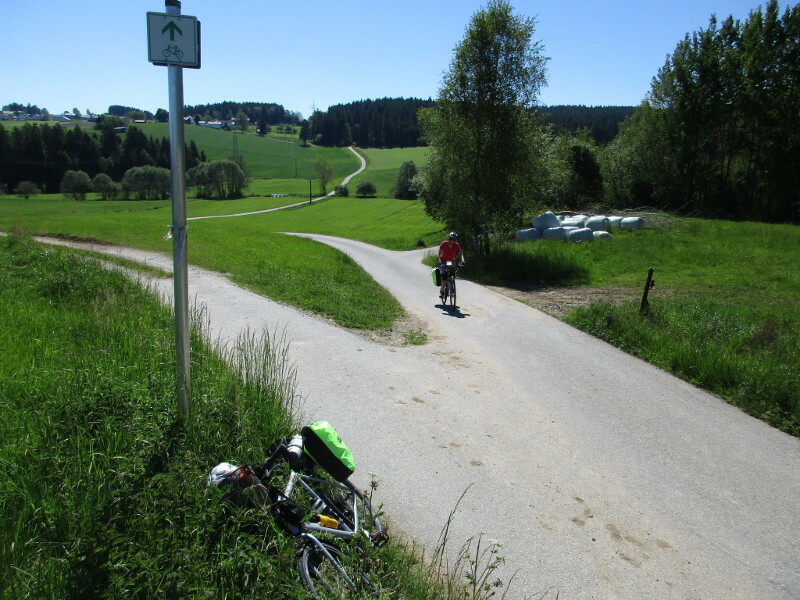 The cycleway was still separated from the trucks, but it was not as pleasant and we were getting worried about what Hirschau would be like. 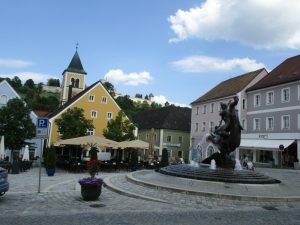 Hirschau is luckily off the main road and a bit away from the mine, it is a lovely little town. We were disappointed that the accommodation we were aiming for was charging quite a bit more than advertised on their website. 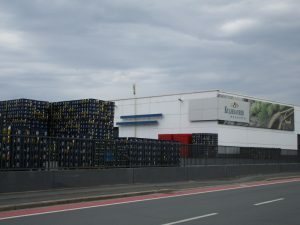 We went around and asked at the other places in town but they were full – we suspect with employees from the mine. In the end we had to take the more expensive accommodation (without breakfast to keep the cost down). We decided not to eat there, and found the local pub. 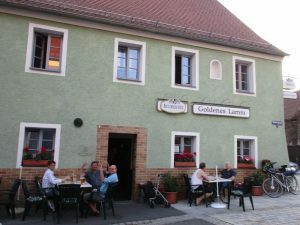 It is called the Goldenes Lamm and we had a wonderful evening there with some regulars who live just around the corner. 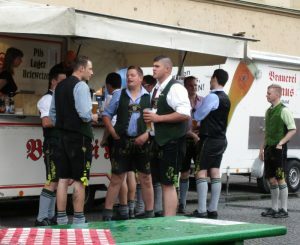 A lot of discussion on Bavaria, politics, beer, etc. We also had some surprisingly good pub food – curry wurst, asparagus toast, soup. 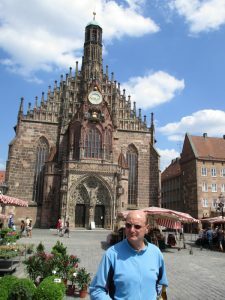 The pub is right next to the Catholic church and the town square – the church bells struck the hour, as well as half and quarter while we sat there. Some children dressed in white arrived and began to process around the outside of the church with candles singing. This was a ceremony to do with their first communion the Sunday before. 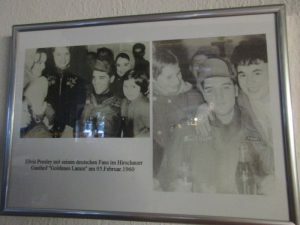 Elvis visited this pub in 1960! 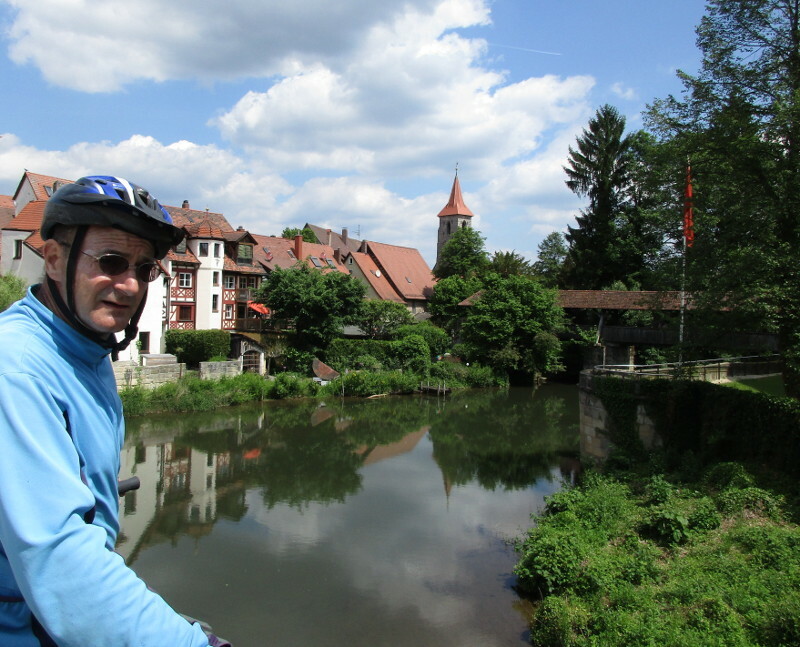 Today was a longer ride – 82km, from Chammunster to Burglengenfeld. 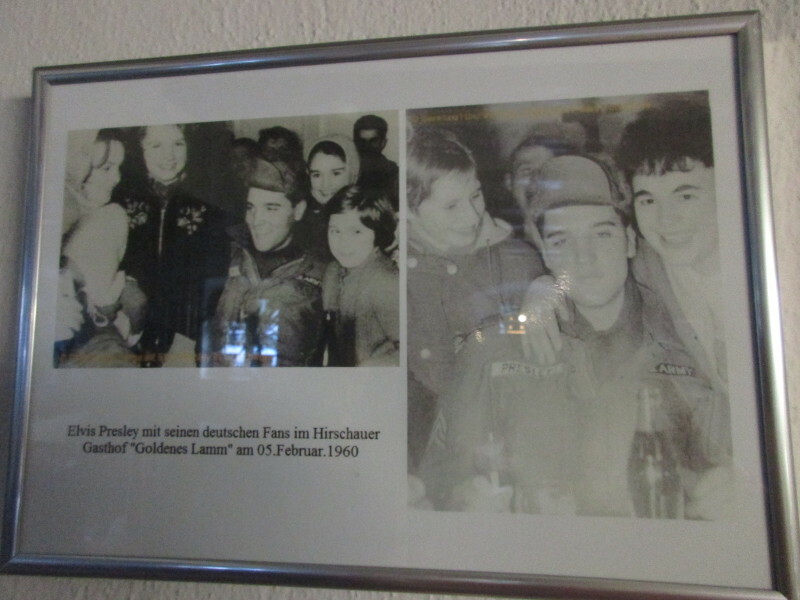 We had an early start this morning (before 8am) as the gasthaus offered an early breakfast. The sun already had some heat in it and we knew we were in for a hot day ahead, so we were keen to do most of our riding in the morning. The first part of the ride was flat and easy. It became more difficult when we ran into some roadworks that took us off track and added a few extra kilometers to our journey. We entered some steep woodlands just after the cloister at Walderbach. Jenny took a wrong turn while Kris rode on ahead and we became separated. Jenny stopped at another fork in the road further on and waited anxiously for half an hour or so as Kris backtracked and worked out what had happened. 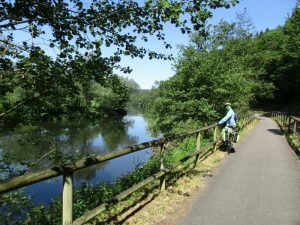 The bike path then came alongside the river Regan. 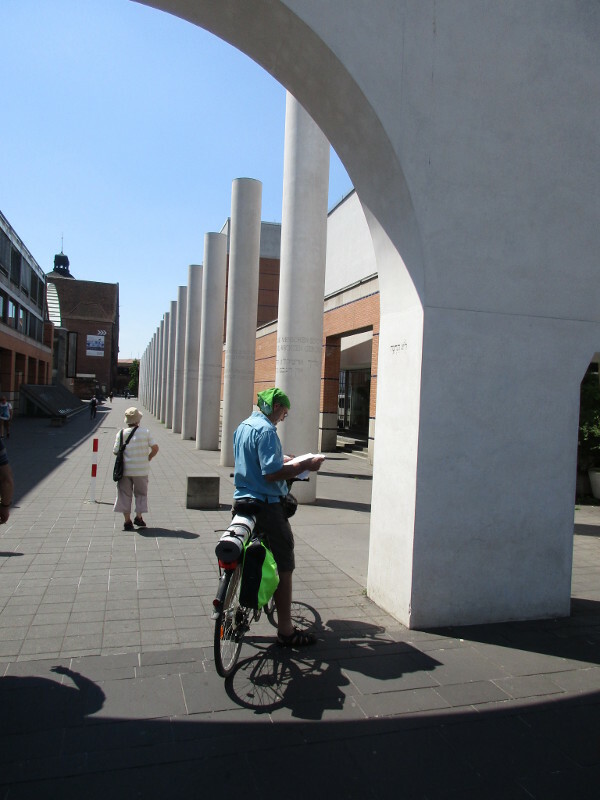 We stopped at Nittenau, a biggish town to eat a pastry and some ice cream outside the supermarket. It was past midday and very hot at this stage, so good to cool off a bit. 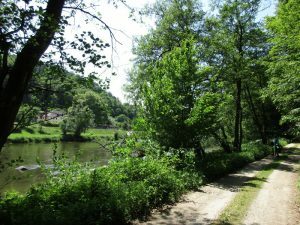 Then we crossed the river to join the Marienthal cycleway, which took us up and down through some woodland. It was a relief to ride in the shade, though the road was not easy (unsealed etc). We reached our target area for accommodation when we got onto a tarred road and reached Teublitz. We had not booked accommodation on-line, so had to find some on the ground. There was not much in Teublitz and the woman at the Rathaus (town hall) advised that there was accommodation is Burglengenfeld, only a few kilometers away. 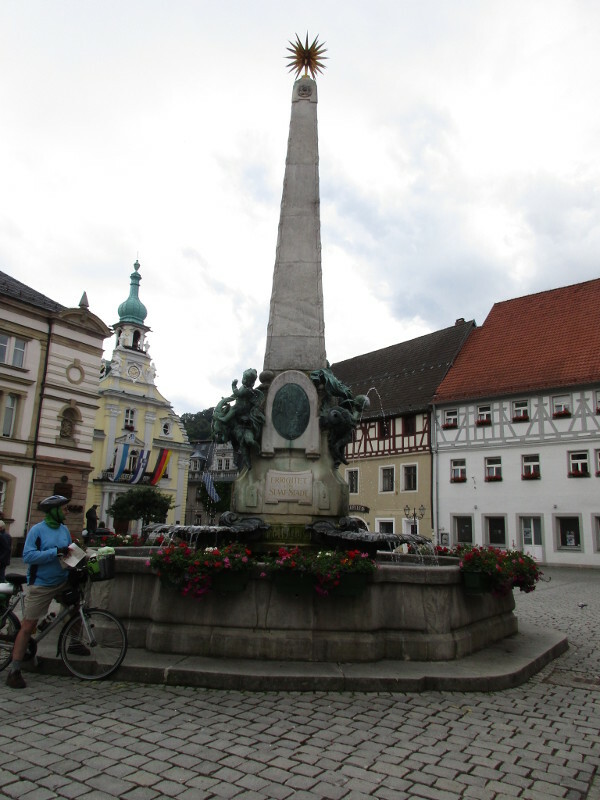 Burglengenfeld was a much prettier town and the tourist office gave us a list of accommodation. 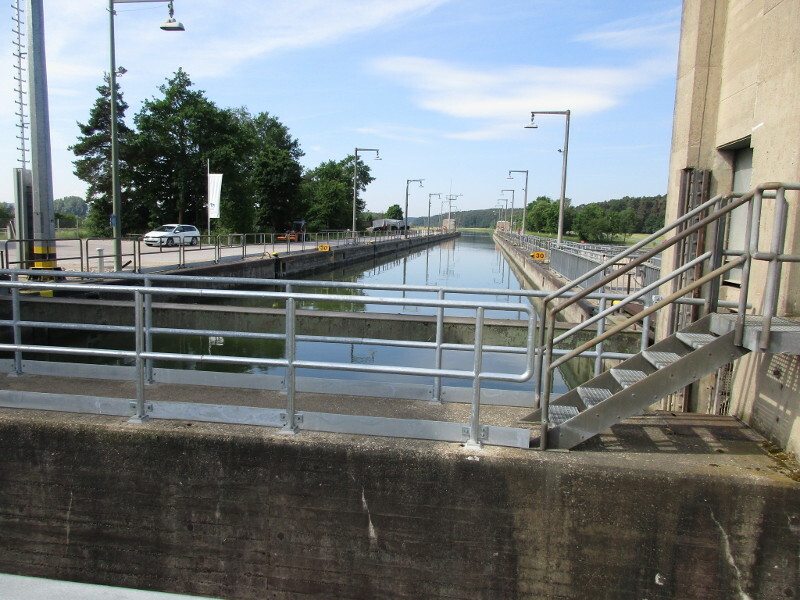 We went to our preferred accommodation on the outskirts of the town and found a sign saying that it was closed for a Ruhetag (rest day/ day off). 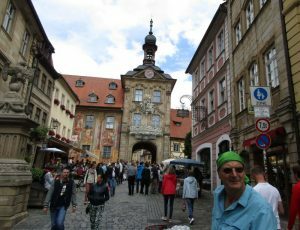 As we were standing there looking at our list to decide where to go to next, someone came out of the gasthaus. We spoke to him and he said there is a possibility of a room. A little while later he came out with a key! We seem to have the place to ourselves. The room is nice and big, it is very reasonable and breakfast is included. The only thing we did not have is Wifi. 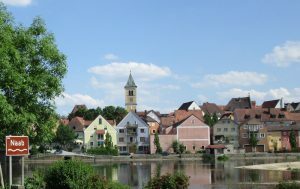 Later on we walked through the town to look for some food and drink. We stopped at a pizza place and ended up helping the owner’s daughter with her English speech – for a school exam. We got our pizza for free! 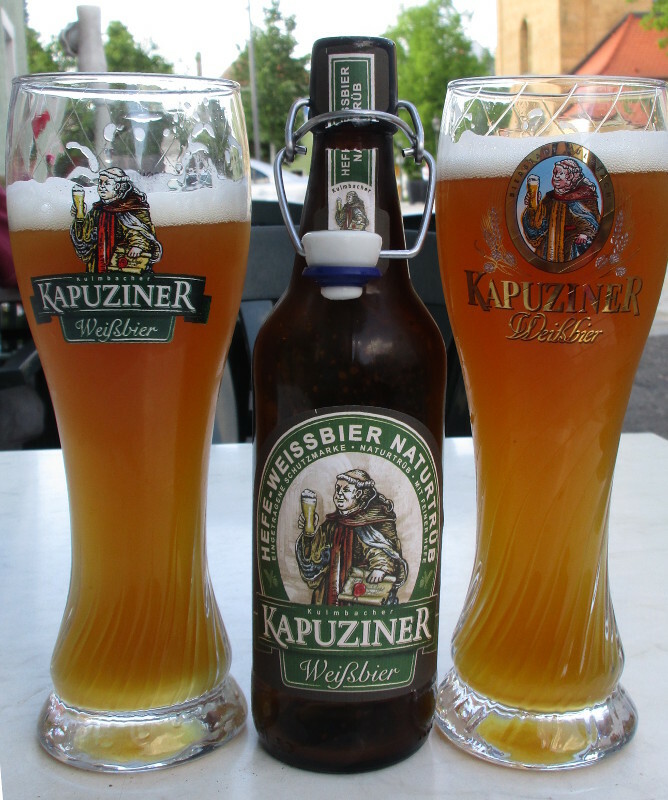 We then tried Weizenbier at three different cafes – we sat outdoors for the first two and inside on the last. 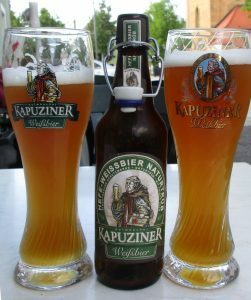 The last one was also a Greek restaurant and had the best beer. We had a wonderful Greek anti-pasta platter and pita bread – it was so good we ordered a second one. We were both really full and satisfied by the time we rolled back to the hotel. 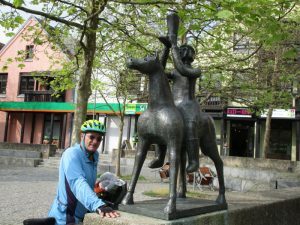 Today we rode 52km – from Patersdorf to Chammunster. We are having a bit of a heatwave – we are told that spring has not come to Bavaria this year – it has gone straight from winter to summer! We left as early as we could, in the cool of the day, after our good German hotel breakfast – including yogurt, boiled egg, bread rolls with cheese and cold meats – and plenty of coffee. The first part of our ride was still hilly, but along good cycle ways – and through green fields dotted with little villages and farmsteads. 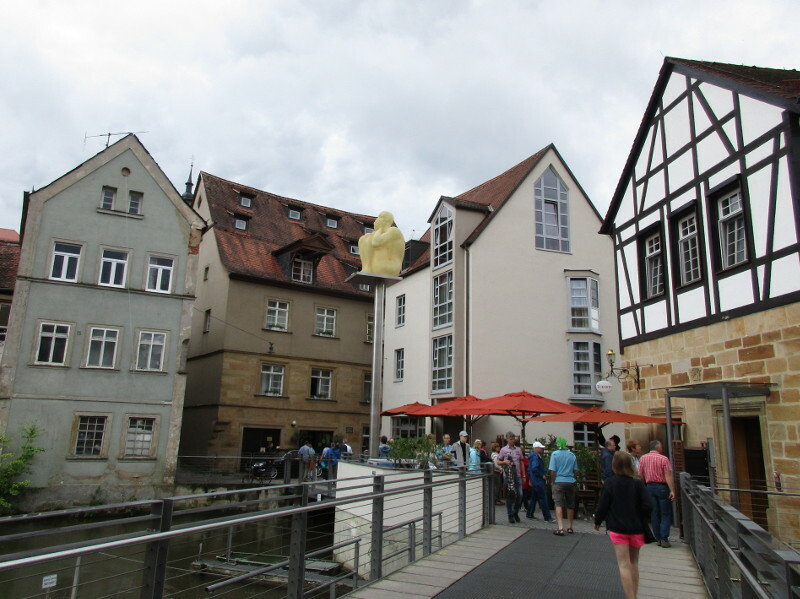 We soon came to Viechtach, where we found an Edeka supermarket for some supplies (more sunscreen!). 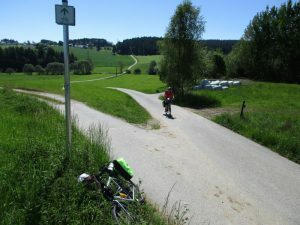 After this we got onto the Regental-Radweg. The first 20km or so was built on an old railway line. 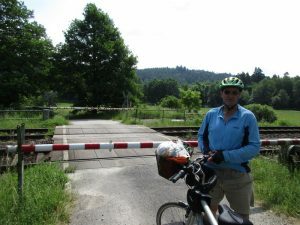 Although the countryside was hilly, we had a gentle ride because of the well graded train track – though our overall direction is still uphill. Before we knew it we had overshot our destination- we should have turned off at Chamerau, but we almost cycled all the way to Cham. 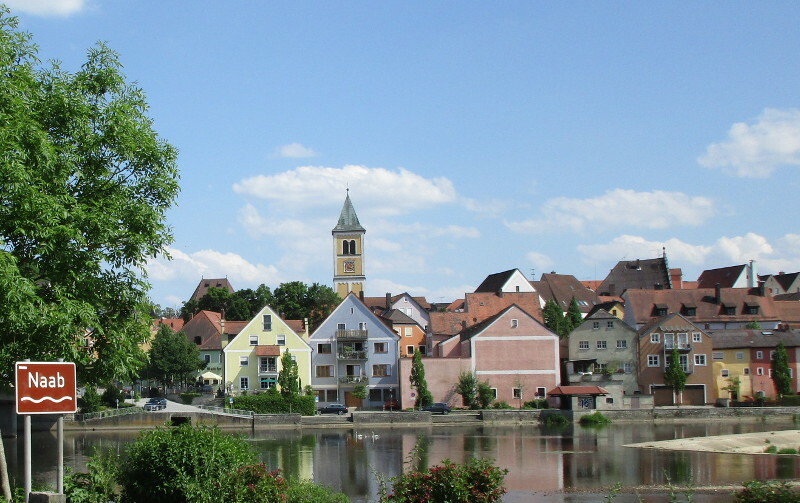 We crossed the river and made our way back to Chammunster, where we paused to eat our apples and buy some more snacks at a small shop. 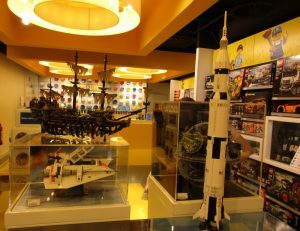 The shop keeper was very talkative and she had a broad Bayrische accent. 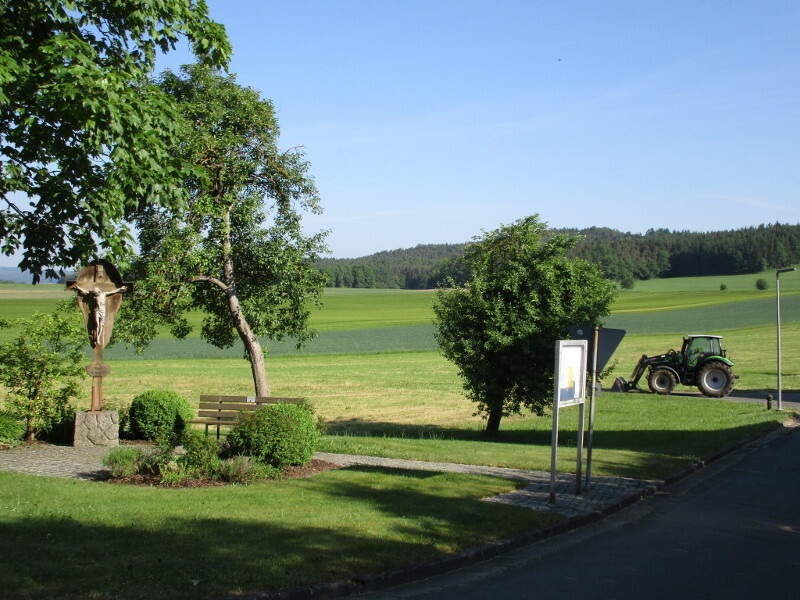 Our accommodation is just down the road from Chammunster, with fields all around and a forest behind it. 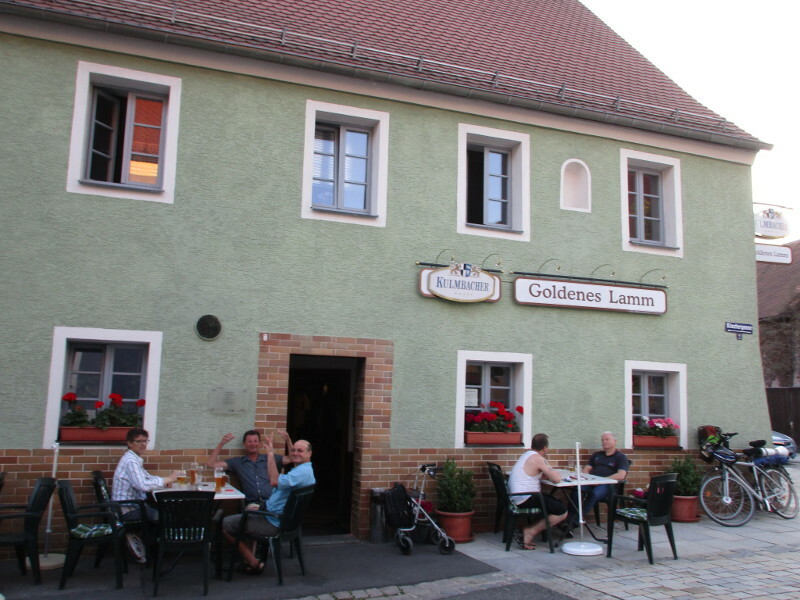 It is another lovely traditional gasthof, where you can drink beer and enjoy a hearty meal at the end of the day. We checked in early again and had another restful afternoon out of the heat – becoming a habit for us now. 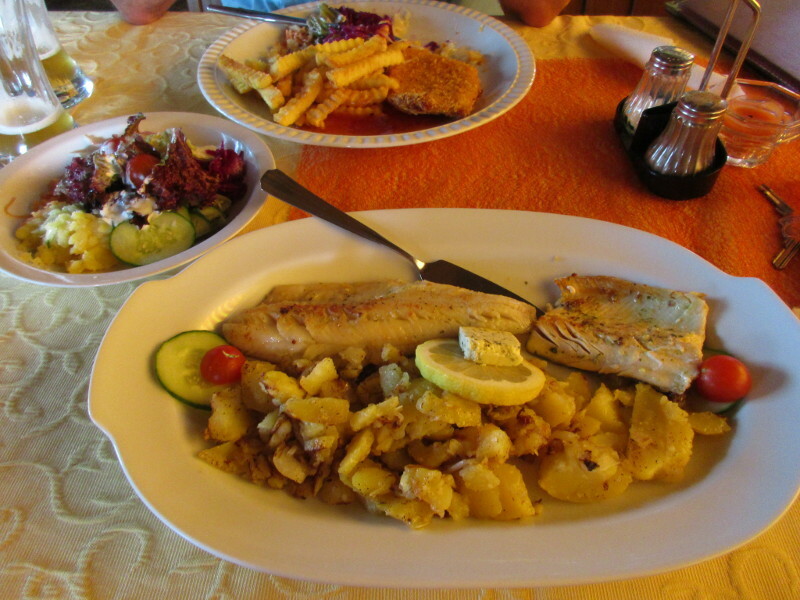 Jenny had trout and Zander (also a freshwater fish) later on, which was a real treat. The meal came with salad, which comes in a separate plate – all very good value for E10.80. Later on Jenny walked out of the hotel, to see the sunset at around 9pm. 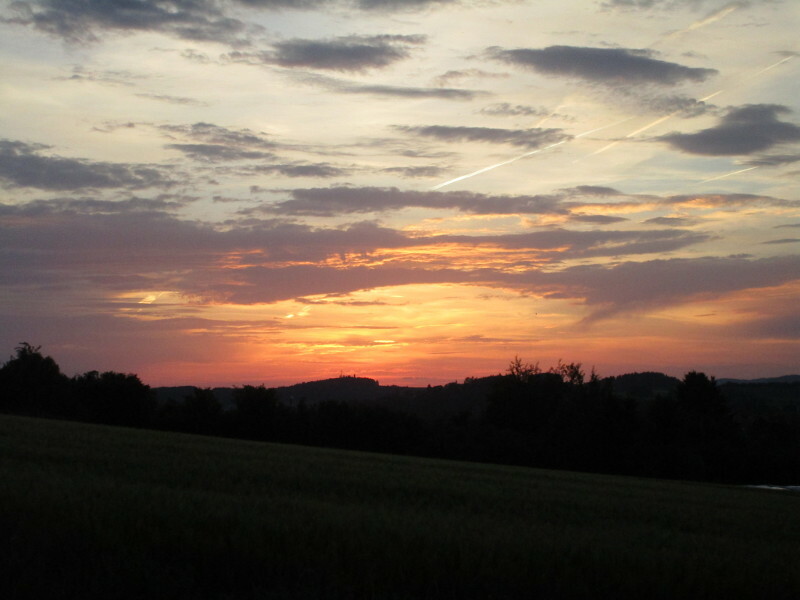 It was a beautiful moment – with the air cooling down finally after the heat of the day. 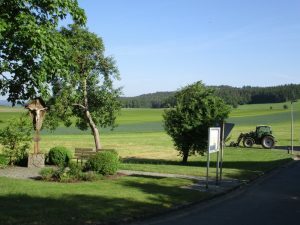 There was a very slight breeze in wheat field next to the hotel – the wheat is very green and fresh. The sky displayed coral pinks and reds below speckled clouds. The sound of traffic and a dog barking were constant in the background – but also birdsong and running water. 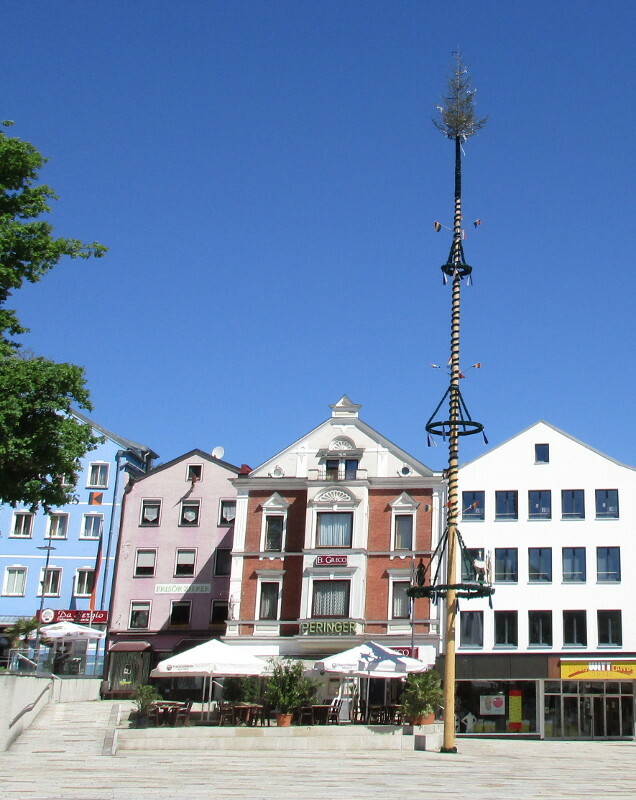 We left Spiegelau after a fantastic breakfast that had every option you could possibly think of – including sausages and mustard! 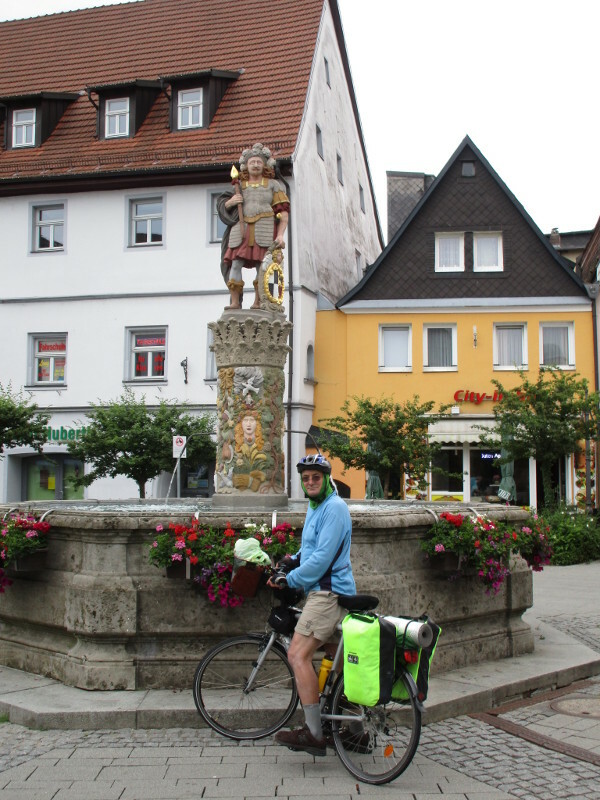 Our route for the day was not an official bicycle route – Kris once again found us small roads to travel on between little towns – Kirchdorf am Wald, Rinchnach, Regen, Sohl, Kaikenried – to Patersdorf. Regan was the biggest town we passed through and we paused in the town square. It was very hot. 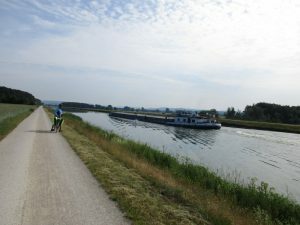 We ended up doing a shorter route than we expected – only 40km – as we zig zagged across the countryside we found some excellent bicycle paths that are not advertised. The entire day was through gentle hill country – so we had our share of climbs as well as nice downhill runs. 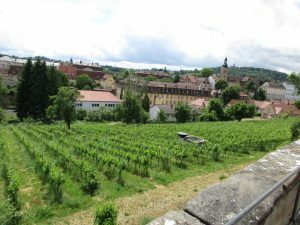 It soon began to get too hot – which makes the uphill climbs difficult. It was also a festive Sunday (maybe people are still celebrating Pentecost?) 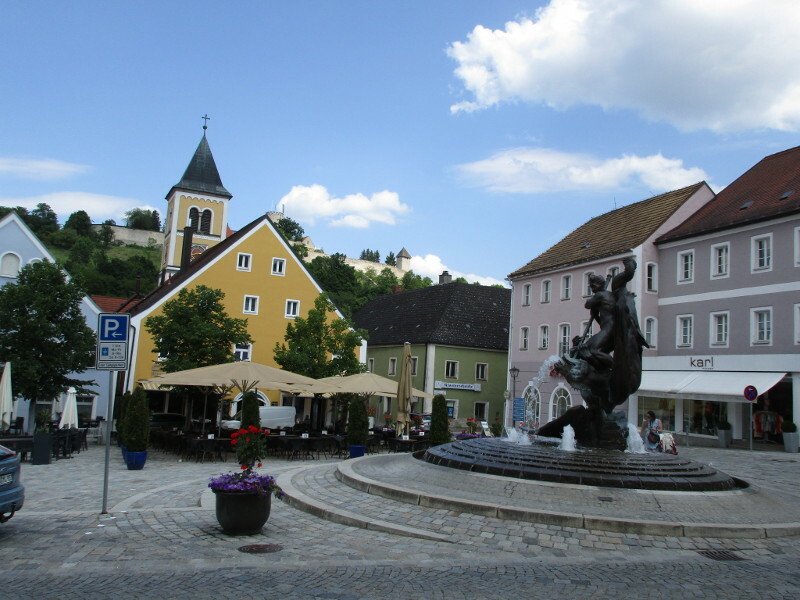 – we rode past a couple of tents filled with people, some in traditional dress, and the sound of Bavarian Brass Bands emanating from inside. 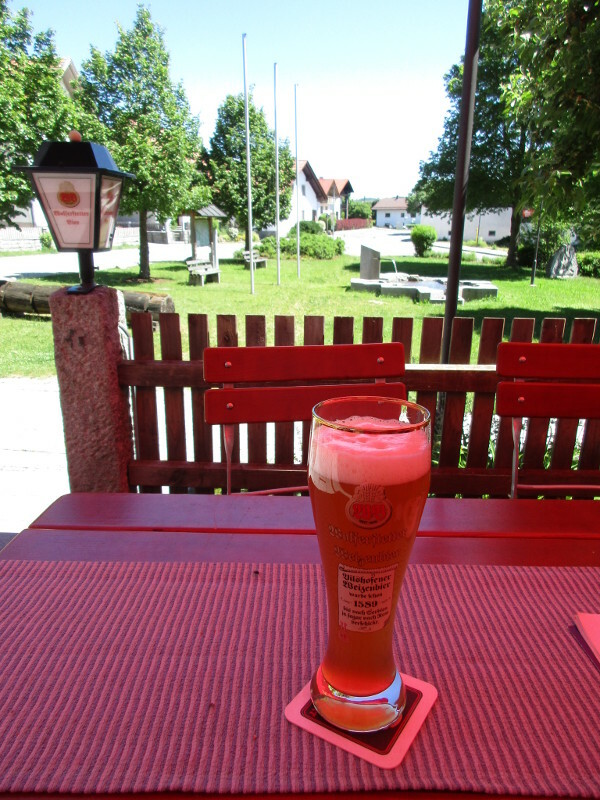 We arrived at Patersdorf just after 1pm, and were pleased to see that the Gasthof includes a restaurant and a terrace where you can sit and drink beer. They kindly let us check in early and we had a restful afternoon out of the heat. Later on we had a delicious and reasonably priced meal on the terrace. 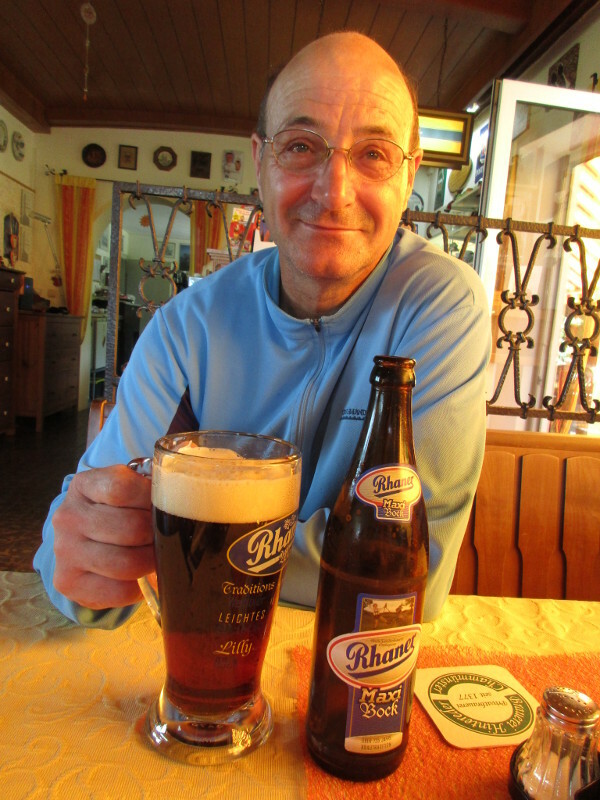 We are enjoying these traditional German Gasthofs – they are great value and very comfortable. A half a dozen older, obviously local, men sat at another table, drinking beer and chatting. 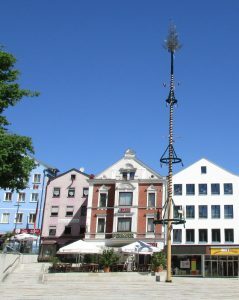 We were later told that this is a “Stamtisch” – a group that meets regularly for conversation.